These seasoned skillet pork chops come together in less than half an hour for a delicious weeknight dinner! The tangy sauce is perfect on the side. There’s something about a roast that just makes dinnertime seem so simple. Even though roasts have to cook for a really long time, they’re so easy…just season and roast. Boom. Even better if you can put it in the slow cooker or the Instant Pot. You don’t even have to heat up your kitchen! The thing is, if you only have two people living in your house, a roast isn’t always practical. I mean, pork shoulders and chuck roasts are great because you can shred them up and throw the leftovers in the freezer, then pull them out whenever you need a filling for a sandwich or a taco. But with a roast that you slice up, the freezer option doesn’t seem that appealing. There was this roast that my grandmother used to make all the time when I was a kid. It was a pork loin, seasoned with a spice mixture that included chili powder, served with a sweet and tangy sauce made from apple jelly and ketchup. It was absolutely delicious and it was one of the things that stands out in my mind that she made. Pretty much a flawless meal. But again…it’s kind of hard to find a pork loin that isn’t gigantic. But you know what isn’t gigantic? Pork chops. So, I took my grandmother’s pork loin roast and turned it into these seasoned skillet pork chops. Not only did they taste great, these skillet pork chops were such a quick dinner. 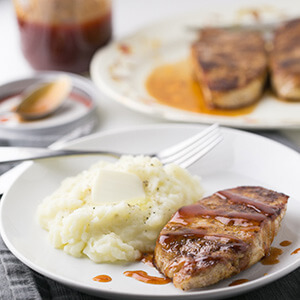 The sauce only takes about 5 minutes to whisk up, and the pork chops come together from start to finish in less than 20 minutes. I served them with some Instant Pot mashed potatoes from A Calculated Whisk (💯). Seasoned skillet pork chops are a fabulous weeknight dinner! To make the sauce, combine all ingredients in a small saucepan. Set over medium heat and stir constantly until the apple jelly melts and the sauce is smooth. Bring to a boil and cook for two minutes. Remove from heat and pour into a serving bowl if using immediately. 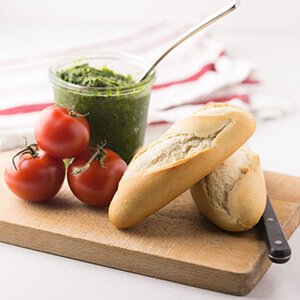 If not using immediately, pour into a jar or lidded bowl, cover, and refrigerate. Preheat the oven to 400 degrees. Combine the chili powder, salt, garlic powder, and black pepper in a small bowl. 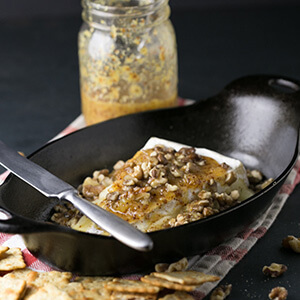 Place the olive oil in a medium oven-safe skillet and set over medium-high heat. Sprinkle the pork chops on both sides with the spice mixture. Place the pork chops in the skillet. Cook for 2-3 minutes per side to brown. Remove from heat and place in the oven. Bake for about 6-8 minutes, until a thermometer inserted into the center reaches 145°. Serve immediately with warm sauce. 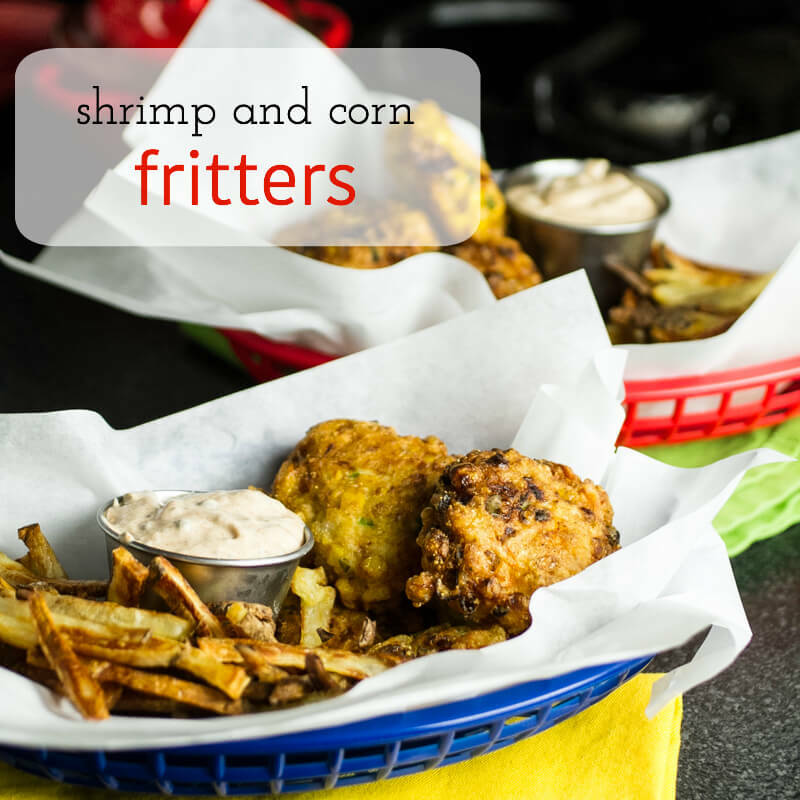 Shrimp and corn fritters are like a delicious hush puppy stuffed with shrimp and corn. They’re a great snack and a perfect dinner! I love a hush puppy. Don’t you love a good hush puppy? A major comfort food meal for me is fried fish, fries, and hush puppies. When I was in college, my roommate and I would take a study break to go to Captain D’s during exam week so we could gorge ourselves on fried food (we called it “having food with our fat”) doused with malt vinegar. We even got an extra order of crispies (there was some special name for them that I can’t remember now). I haven’t eaten at Captain D’s in years, but I still remember those trips fondly. 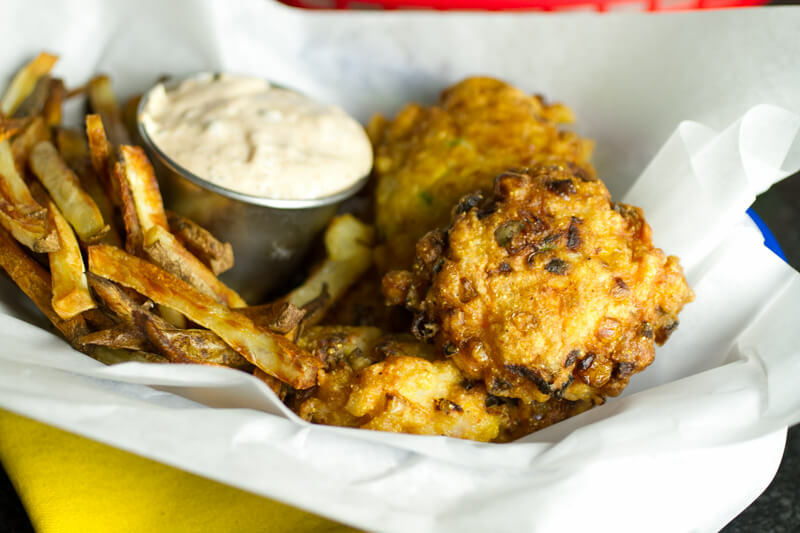 The appeal of a hush puppy is not just in its deep-fried crispiness but also in all the flavors…the cornmeal, the onion, and sometimes a little bit of jalapeño. 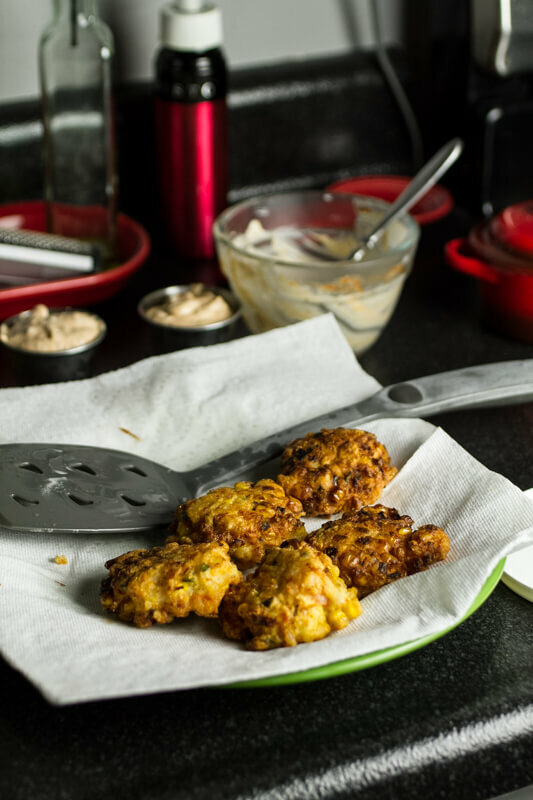 Everything works together so nicely in one little browned, crispy package and, well, if you aren’t eating your hush puppies I’ll gladly eat them for you. I married a man who doesn’t care for hush puppies, so that works out well for me in restaurants. The problem is that when there are approximately two foods (hush puppies and peas on their own) that your husband just really doesn’t like it’s kind of difficult to justify making those things at home. He’s so not fussy that I would feel bad making something that I know he doesn’t want to eat. So….I have to get creative. Like, you know, putting peas in a soup or fried rice. Or making something that’s super-close to being a hush puppy without actually being a hush puppy. Enter shrimp and corn fritters. Since I’ve become a fanatical follower of Smitten Kitchen, I have turned lots of things into fritters. I have not regretted any of it. 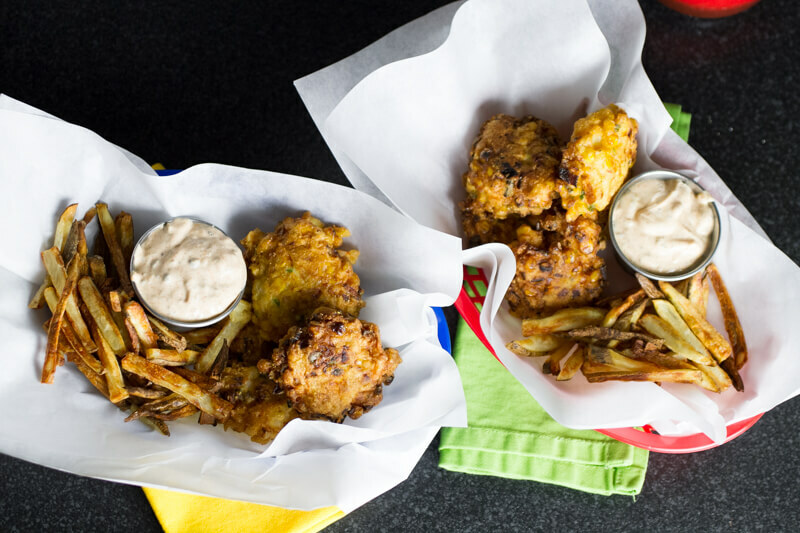 Bonus is that I love food that can be dipped into condiments (ranch dressing and honey mustard are my old standbys, but I these days I love a great remoulade or tartar sauce or comeback sauce just as much). And you can totally dip a fritter. So to make these shrimp and corn fritters, I put the fish (well, shrimp) into the hush puppies, dialed back the cornmeal, added some plant life, and skipped the deep frying for a simple shallow fry. They’re perfect with a simple remoulade and some baked fries. Honestly, I don’t think I’ve ever had a fried fish and hush puppy dinner that was more comforting than these shrimp and corn fritters! 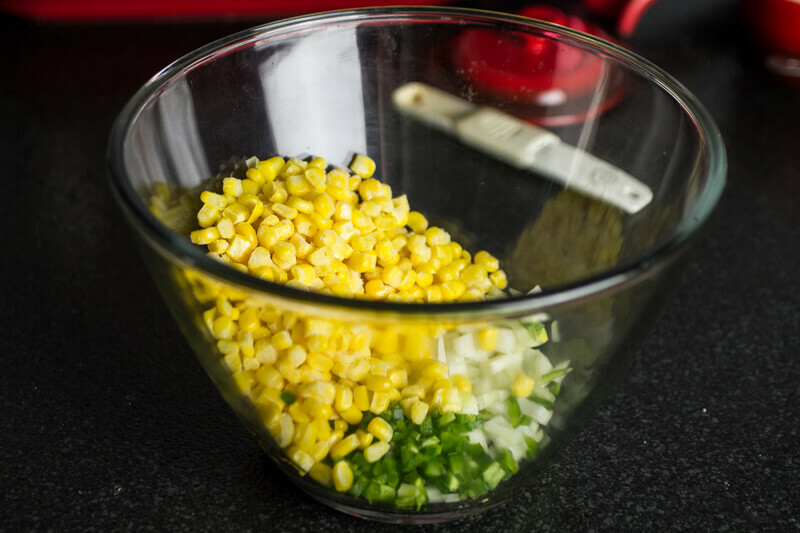 Stir together the remoulade ingredients in a small bowl. Cover and refrigerate until ready to serve. 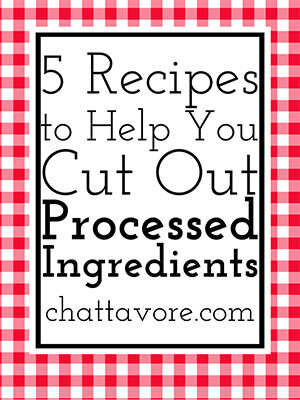 Combine all of the fritter ingredients in a large bowl. Refrigerate for 15-20 minutes. Preheat the oven to 200 degrees and place a baking sheet lined with paper towels in the oven. Pour enough oil into a 10-inch skillet to cover the bottom. Preheat over medium-high heat until shimmering. Measure 1/4 cup portions of the fritter mixture and flatten into a disc with your hands. Carefully place into the hot oil. Cook for 3 minutes per side, until golden brown. Drain on the paper towel lined baking sheet in the oven and repeat in batches of 4 or 5 fritters until all bater has been used. Serve while hot. 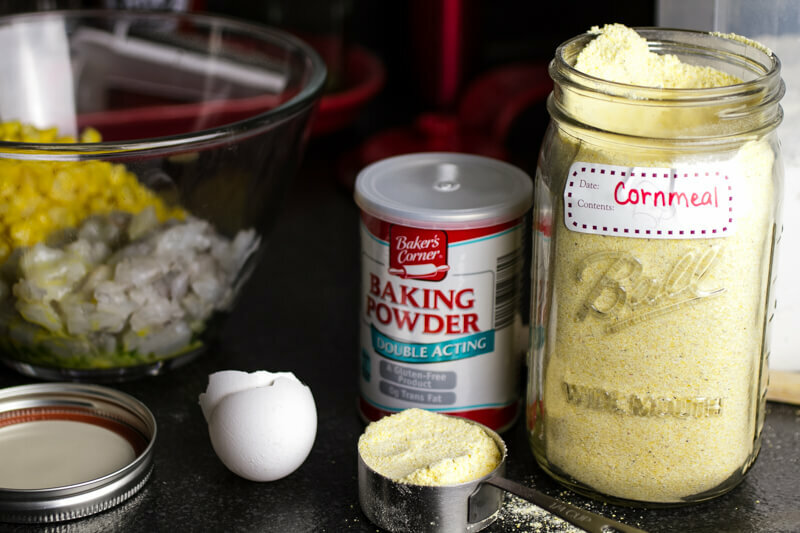 The prep time includes inactive prep time to refrigerate the batter.